This college woman safety kit contains the essentials you need to keep yourself safe in the dorm and out & about! These are times in your life you'll never forget. Keep those precious memories happy ones. Staying vigilant about your safety may not be a college course but it's one of the most important lessons you can learn. Please don't learn the hard way! A high state of awareness is more essential now than ever. You're exposed to things you've never seen. You're seeing things you've never pondered. People are acting so outside your norm, you wonder where you are or where they came from. On top of that, you have to learn and study and still get good grades! Aside from the excitement of your newfound freedom, you also have the responsibility of taking care of yourself like you've never done before. This college safety kit is designed for newly minted college women who need the tools for staying safe and out of trouble. 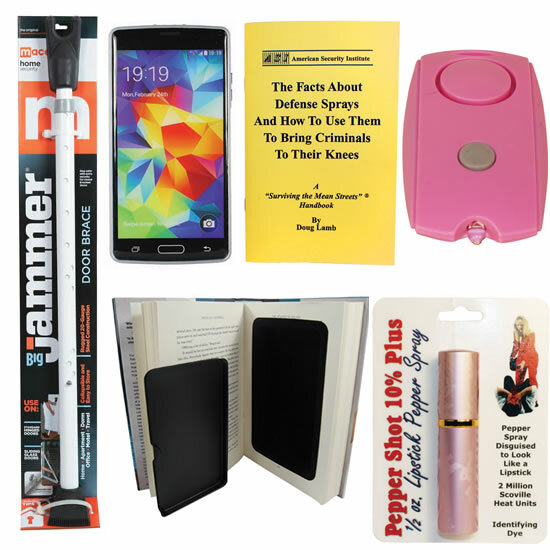 A step up from our dorm room kit, this college dorm essentials package will keep you safe in your room while giving you the confidence to go about the campus without worry. The door brace keeps your dorm room door shut and gives you the feeling of safety while resting from a hard day of classes. Always use this before you go to bed. A book? Well, not really. It's a hidden safe you can use to hide precious valuables like jewelry or money. Place it with your other books on a bookshelf. Keep your things protected. A personal alarm is a LOUD siren that you activate if you are being threatened. It can scare off the person doing the threatening and hopefully will bring someone to help you out. Don't count on some Prince Charming to come to your rescue when you're in distress. You deal with REALITY now and must be prepared to handle things on your own. When it's time to take matters into your own hands, you want tools that work! The lipstick tube is really a powerful pepper spray. Pepper spray should be issued to all college girls as a matter of standard practice but unfortunately, it's not. This little potion of power will get rid of unwanted advances or can even stop a mugging or something worse. Keep this with you at all times and don't be afraid to use it when needed. The Tactical Use of Pepper Sprays manual teaches you how to use your self defense spray and goes over many techniques you should become familiar with, such as dealing with multiple assailants. The last item in this college woman safety kit is the cell phone stun gun. Even if someone is grabbing you or you are in water, you will not get shocked. Only the person on the business end of this will feel it's devastating effect. If it gets up close and personal, use the stun gun! The pepper spray can be used from a distance so use that first! If it's too late, then use the stun gun. Whenever you use either of these tools, immediately run for safety and get help. Call the police and give a full report. You can order this package by adding it your cart above. We're giving a steal of a deal because we want YOU to have this protection.